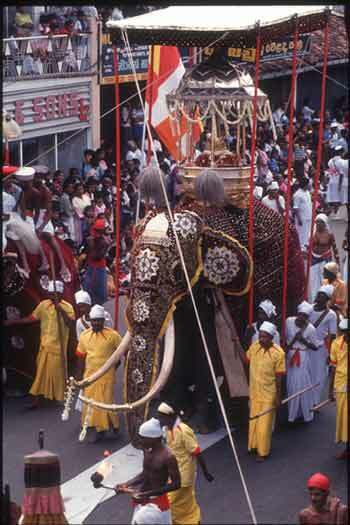 The Valli Yak Mangalya, the finale of the Kandy Esala Maha Perahera, enacted at the Maha Vishnu Devale in Kandy has its origins in the Aluthnuwara Perahera. The Valli Yak Mangalya, is performed for seven days at the Maha Vishnu Devale. This ceremony is enacted on the day of the Day Perahera at Aluthnuwara. At this function on the seventh day, young men and women who know of the existence of the Valli Yak Mangalya make vows by tying them on the ' tail ' of the Ves dancers. This is mostly done by unmarried couples and mothers to give their daughters in marriage before the next Valli Yak Mangalya. These vows are fulfilled in seventy per cent of the instances. Valli Yak Mangalya was a secret ritual and it was only latterly that people could view it. The main purpose was to ward off the ' evil eye ' from the elephants, Nilames, drummers and those involved in the Kandy Esala Maha Perahera. The drummers are from Aluthnuwara Devale and they do not perform at the Kandy Esala Maha Perahera as a rule, because their own Perahera is at Aluthnuwara. Their presence in Kandy is because once the deity of Maha Vishnu was at Aluthnuwara and from there the deity was brought to Kandy during the time of King Senerat. This ritual is entwined in legend and folklore and part of the ritual is borrowed from Kohomba Kankariya. This ritual is believed to be the oldest form of ceremonial dance known also as ' Kohomba Yakkum '. The origin of this ritual is attributed to King Panduvasdeva's time. Kohomba Kankariya was performed out of love and compassion for King Parakrama Bahu VI of Kotte, according to J.E. Sederman. For seven days the dancers perform at the Devale of Maha Vishnu, first by tying young coconut flower over the performance area. On the seventh day, the flower is brought down and then the dancers dance in an anti-clockwise direction. The people who witness this pick the coconut inflorescence and take them away to be tied in their homes until the next Valli Yak day. On the seventh day, Gara Yakka enters, (he has been summoned for seven days) and Kiribath, oil cakes, water and coins are offered for him to depart in peace. As the story goes, Gara Yakka was in fact a Prince who was banished to the wilds as he had married his sister. The astrologers who had seen his horoscope warned the King and Queen, that he would have a sister of exceptional beauty and that he should be sent away from the country. It is said that he became a priest who had powers to fly. But, when he saw his sister Giri Devi, he is said to have been unanle to resist her and both lived as husband and wife. P.Wirz in ' Exorcisms and art of healing' gives a number of instances connected with Gara Yakka and Giri Devi. Gara Yakka is reputed to have a powerful appetite and it is said that he was ordered by Goddess Patthini to clean the home of God Kataragama, for Goddess Patthini to arrive, and had done so, devouring all the furniture and all else and still scolded God Kataragama for not giving him enough to eat. It is this Gara Yakka that is called for at Maha Vishnu Devale to ward off the evil eye and subsequently departs in peace. The Sri Dalada Esala Perahera in Kandy commenced on August 4, 2011 with the first ritual of planting of the 'Kap' in the four Devalas, Natha, Vishnu, Kataragama and Pattini. The Nayakkar Kings who ascended the throne of Kandy made popular the worship of Hindu deities and the Sri Maha Vishnu Devalaya plays a major role in the Esala Perahera as the 'Kapa' is first brought to this devalaya and then distributed to the other three devalas. 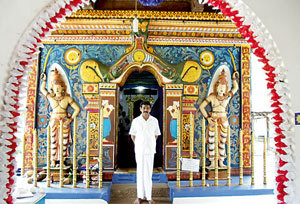 This first ritual was performed by Pallegedera Vedaralalage Herath Banda the Wannaku Rala who hails from Aluthnuwara. He spoke to the Sunday Times of the final ritual which is the Valiyak Mangalya that is performed for seven days at the Maha Vishnu Devalaya. Kalawane Mudiyanselage Varuna Bandara, the Kapu Rala or Kapu Mahattaya as he is presently known joined in to give more details of the ritual. Valiyak Mangalya is a Shanthi Karma performed at the Maha Vishnu Devalaya to ward off evil effects on those who took part in the Perahera. Varuna Bandara, the Kapurala said the Devalaya has to provide the Gurunnanse with 32 Neli of raw rice (16 kilos, 12 Sivili Walang, (small clay pots), 16 coconuts, 16 betel leaves, 16 panduru (coins) and flowers. There is a belief that gold and silver had been given during acient times. The Gurunnanse, W.P. Simon Devanagala of Hatarakorale near Aluthnuwara is the main Yakdessa who has been performing the Valiyak Mangalya since 1971. He proudly states he is 90 years old and still performs with his two sons, Sugath Nishantha and Sumanatissa Nissanka. Explaining the ritual which is performed by these Yakdesso in the Hewisi Mandapaya in the Devalaya for seven days, he said that on the first day the ritual starts at about 7.30 in the evening and continues for about one and a half hours. A Gavara Mala (coconut flower) is tied on to the roof of the Hewisi Mandapaya. The Ata Magala is drawn with raw rice on the floor, the Sivili Walang with flowers, betel leaves and panduru are placed to begin the performance. "A pirith noola is placed near the image of the Vishnu Deiyo and thereafter the three of us sing the praises of the Deity but do not dance." On the second day they bring down the Gavara Mala and dance round it whilst singing. The performance starts in the evening and concludes after about one and a half hours each day. However, on the sixth day it continues till morning. On the sixth and seventh day the Sivili Abharana which is a flat plate made of wood and silver is wrapped in a blue cloth and brought out by the Kapu Rala and is placed on the Sivili walang. It was stated that during the early days the Sivili Abharana was not covered. Some years ago, after the Valiyak Natuma was performed, three Yakdessas had died after each performance during three consecutive years. Thereafter they had decided to wrap the Sivili Abharana to ward off any evil effects that may befall the Yakdessas. Each day, the number of dancers and drummers increases and on the seventh day there are about seven dancers and six drummers. On this day, the Valiyak Shanthi Karmaya begins at about 2.30 in the afternoon and ends by 5 in the evening. The Gara Yaka, a Yakdessa with a Devil mask comes in shouting asking for Valapalam, Soru - bananas, rice, kevum etc. Once these food items are given he shouts and runs away. The people then break the Gavara Mala and takes the pieces home believing it to bring good luck and fortune. After the Gara Yaka leaves the Hewisi Mandapaya, the devotees tie Panduru (coins), make vows, offer pooja of fruits, flowers to the deity and receive the Deity's blessings. This ritual is performed by the main Yakdessa who takes on the role of the Kapu Mahattaya. Two women participating in the ritual are the Alatti Amma, whose duty is to prepare rice which is offered to the deity and also respond to the Ayubowewa greeting at the beginning of each sthothra gayana (kavi/poems) and dance item.